Click on the image to be taken to the video. 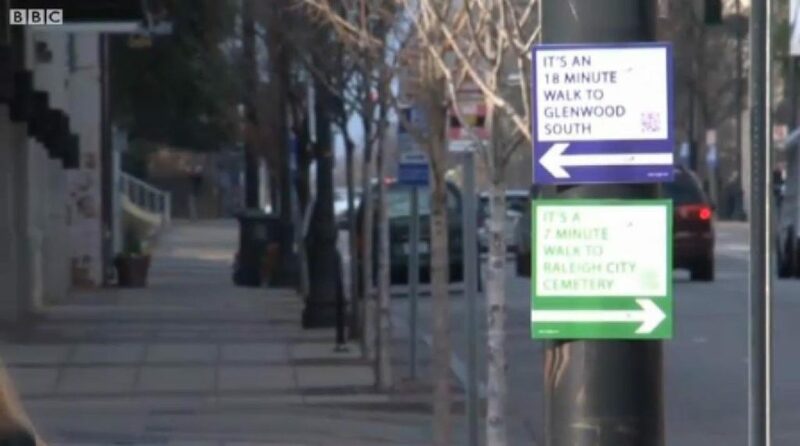 In order to encourage walking and re-educate the public on transportation choices, members of a new campaign in Raleigh, North Carolina placed unsanctioned street signs designating the amount of time it takes to travel to key destinations by walking. “Walk Raleigh” is a campaign to help people discover how many minutes it takes to get somewhere by foot, instead of how many miles it would be for them to drive, Matt Tomasulo explains. This campaign is similar to the “Legible London” project, which was a comprehensive effort to get Londoners walking and saving time. The project came after a 2006 study, which concluded that many journeys between neighboring central London Underground stations can be quicker by foot than taking the Tube. The campaign is also an effort to relieve overcrowding of public transportation and improve public health. Would similar street signs encourage you to walk more in your city? Follow the “Walk Raleigh” campaign.